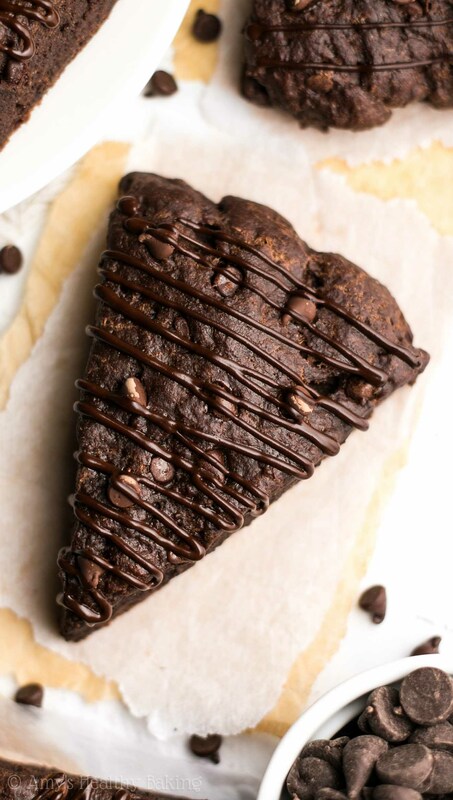 An easy recipe for rich chocolate scones full of chocolate chips & topped with a dark chocolate drizzle. They’re a chocoholic’s dream come true & don’t taste healthy at all! The next day, I drove over to the grocery store to stock up on baking staples before I dove headfirst into recipe testing. I nearly bought out their entire inventory of my favorite cocoa powder and chocolate chips… And did that again a few weeks later! I strategically planned my schedule of cookbook recipes to avoid testing five desserts in a week (plus the recipes I still baked for this blog—it’d be impossible to run enough miles to compensate!). Instead, I worked on one snack, one or two breakfasts, and two desserts each week, and I always found myself staring at countertops and a fridge full of baked goodies every Saturday… Then knocking on my friends’ and neighbors’ doors with big platters of them to give away! Because I absolutely adore muffins and scones, those were the first few breakfast recipes that I tested. I love pairing them with Greek yogurt for breakfast, nibbling on them alongside coffee as a mid-afternoon pick-me-up, and even reaching for them as a pre-bedtime snack. Those types of baked treats never last long at my house! 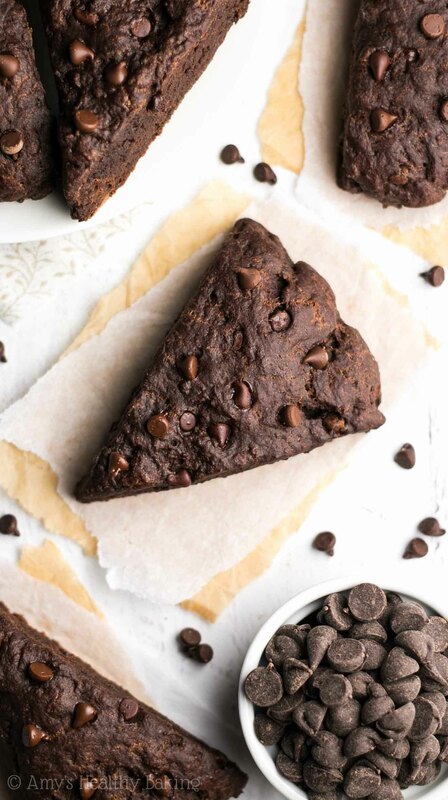 Since I’m super excited that my Healthier Chocolate Treats cookbook is coming out as an eBook next week (you can see a sneak peek and preorder it here! 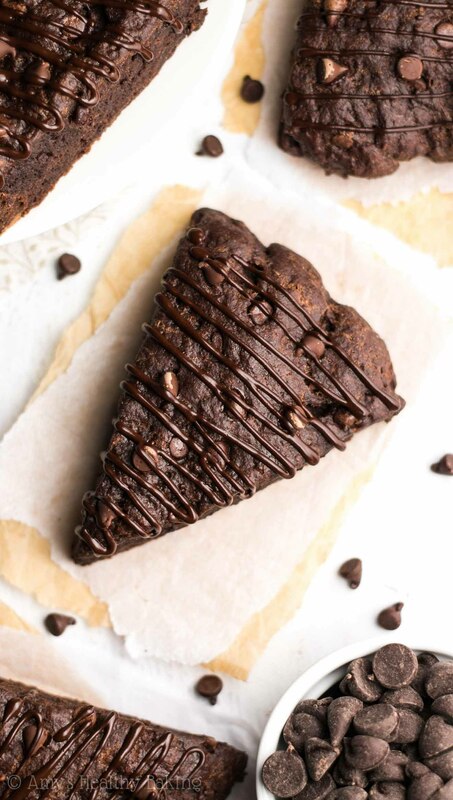 ), I’ve been staring at pictures of the muffins and scones that I included in the cookbook for the past few days… Which inspired me to bake these Clean Triple Chocolate Scones! 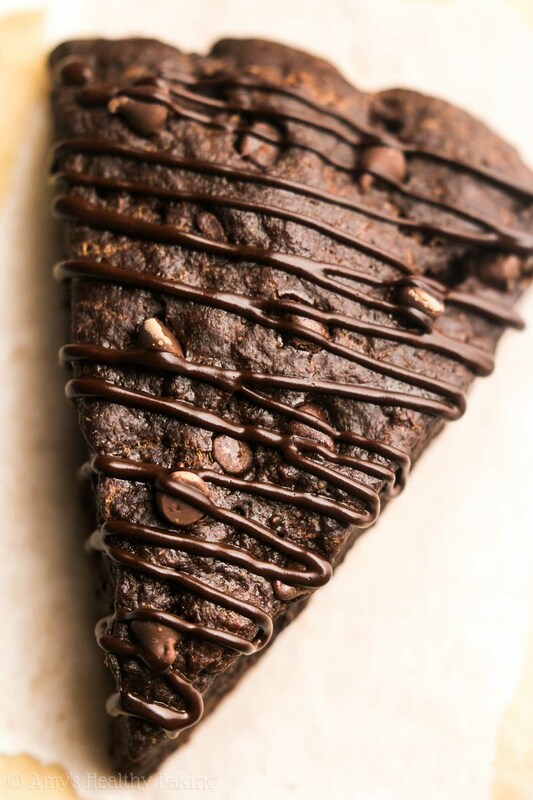 Yes, triple chocolate! Chocolate dough. Chocolate chips. Chocolate drizzle. And they’re healthy too… They’re a chocoholic’s dream come true! Mmmmmmmmm…. Doesn’t that look good?? You’ll start with a combination of white whole wheat flour and unsweetened cocoa powder. White whole wheat flour is made from a special type of finely ground white wheat, whereas regular whole wheat flour comes from heartier red wheat. This gives white whole wheat flour a lighter taste and texture, similar to that of all-purpose flour, but it still has the same health benefits of regular whole wheat flour. You’ll just need regular ol’ unsweetened cocoa powder. No need for Dutched or special dark—the scones already taste plenty dark without those! You’ll use a full ½ cup of cocoa powder in these scones, so using those other types will make them taste bitter instead of rich and chocolaty. So stick with the regular variety! For the perfect light and tender texture, you’ll want to use very cold butter. Unlike traditional recipes that call for an entire stick or two, you just need 2 tablespoons in these healthier scones! You want the butter to stay cold until you put the scones in the oven because when the butter starts to melt at that high temperature, it creates little air pockets, which gives the scones their light and tender texture. Note: For this reason, coconut oil and spreadable butter won’t achieve quite the same texture. You can use them in a pinch, as long as you remember that the texture will be slightly different. To keep the scones really moist, you’ll use my favorite ingredient in healthier baking. Do you know what it is? That’s right… It’s Greek yogurt! Greek yogurt provides the same moisture as extra butter for a fraction of the calories, and it gives these scones a protein boost too! And of course… The mini chocolate chips! I highly recommend using mini chips because they ensure that every bite contains a little morsel of melty chocolate. These are my favorite because they taste really rich and melt very well! Just before baking, you’ll brush the dough with milk. This little trick helps seal the moisture into the scones, and it also gives their outsides a hint of a crust. That texture contrast is so irresistible… It’s probably one of the biggest reasons I have very little self-control around scones! ? Pure chocolate bliss! And when you make your own, remember to snap a picture and share it on Instagram using #amyshealthybaking and tagging @amyshealthybaking IN the photo itself! (That guarantees I’ll see your picture! ?) I’d love to see your scones! And if you enjoyed these scones, you’ll love all of the recipes in my Healthier Chocolate Treats cookbook! See a special sneak preview and order yours here! 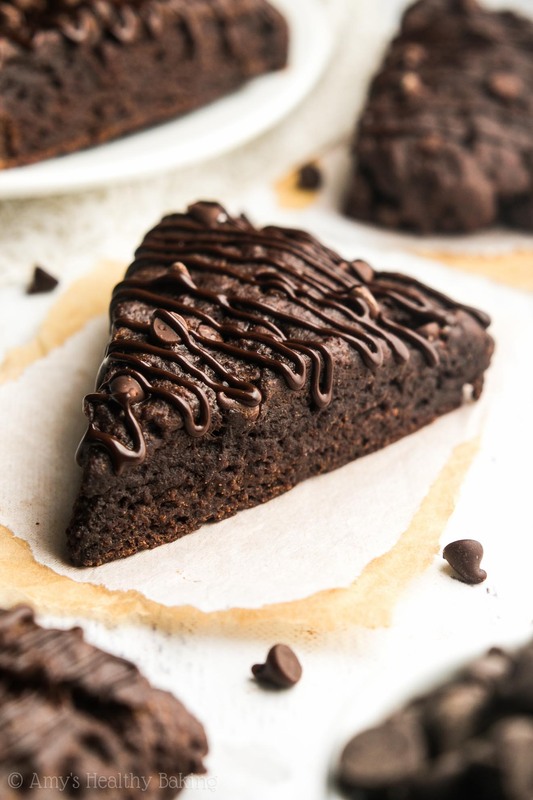 These healthy scones are a chocoholic’s dream come true! 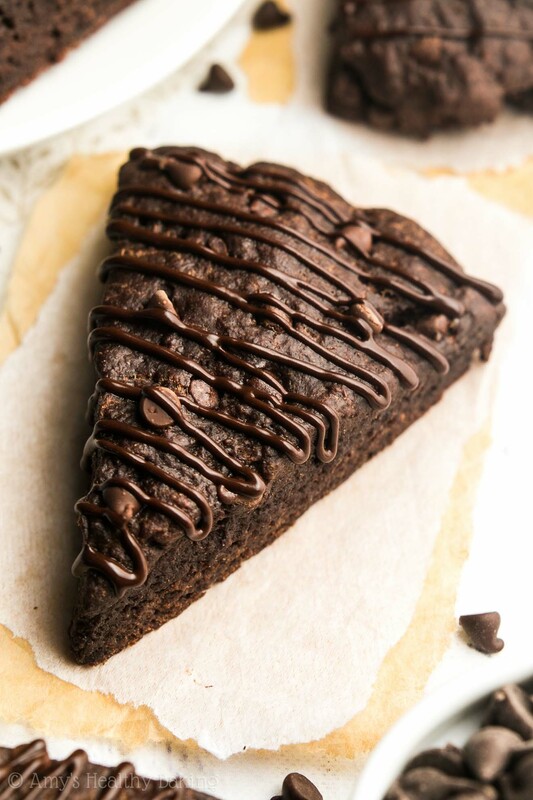 The chocolate scones are really tender and full of chocolate chips. 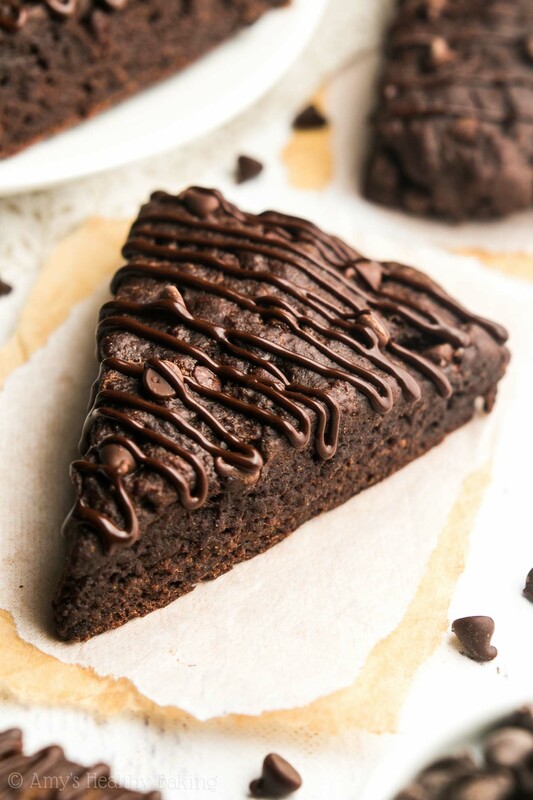 The dark chocolate drizzle really takes them over the top! Leftovers will last for at least 5 days if stored in an airtight container in the refrigerator. In a medium bowl, whisk together the flour, cocoa powder, baking powder, and salt. Cut in the butter with a pastry cutter or the back of a fork until the mixture resembles fine crumbs. Stir in the Greek yogurt, maple syrup, 3 tablespoons of milk, and vanilla. 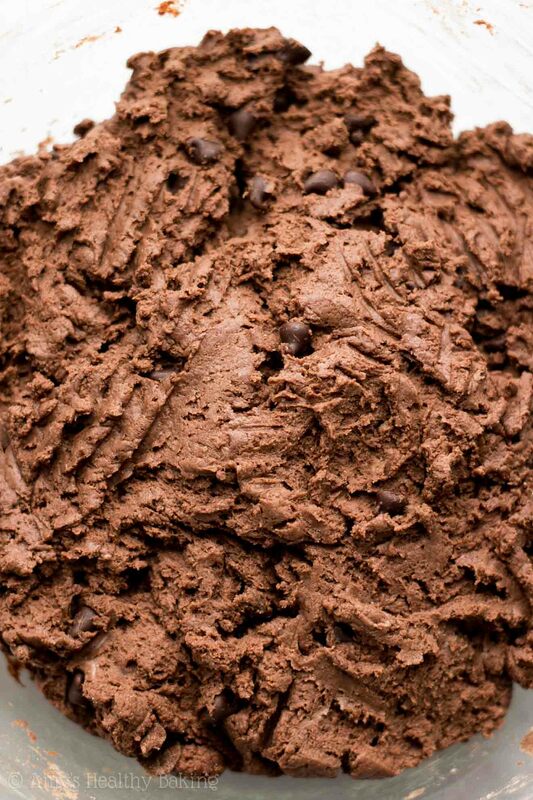 Gently fold in 1 ½ tablespoons of chocolate chips. Transfer the dough to the prepared baking sheet, and shape into a ¾” tall circle using a spatula. Brush with the remaining milk. Slice the circle into 8 triangular segments with a sharp knife. Gently press the remaining chocolate chips on top. Bake at 425°F for 15-18 minutes, or tips of each scone triangle in the center of the pan feel firm to the touch. Cool on the pan for 5 minutes before transferring to a wire rack to cool completely. To make the drizzle, stir together the cocoa powder, maple syrup, and milk in a small bowl. Transfer the mixture to a zip-topped bag, and cut off a tiny piece of one corner. Just before serving, drizzle on top of the scones. Notes: For the gluten-free flour, I recommend the following: ½ cup (60g) millet flour, ¼ cup (30g) tapioca flour, ¼ cup (30g) brown rice flour, and ¾ teaspoon xanthan gum. Most store-bought gluten-free flour blends will work as well, if they’re measured like this. It’s very important to measure both the flour and cocoa powder correctly, using this method or a kitchen scale. I highly recommend the latter! This is the one I own (it’s the best $20 I’ve ever spent! ), and I use it every day. A kitchen scale ensures that the recipes you make will turn out with the perfect taste and texture every time. Too much cocoa powder in these scones will make them dry and bitter. In a pinch, solid-state coconut oil may be substituted for the butter, but I warn against doing this, if at all possible, because the scones’ texture won’t be quite the same. 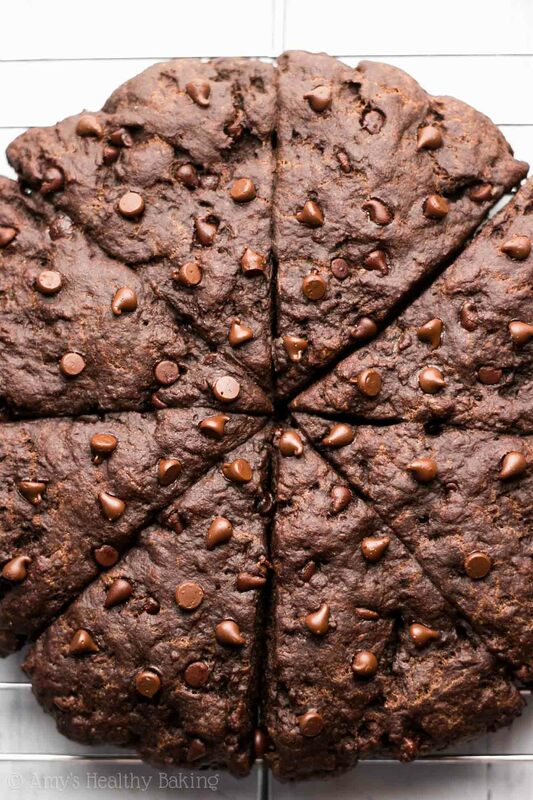 These scones are meant to taste similar to 72% dark chocolate. For sweeter scones, substitute additional pure maple syrup for some of the milk in either the scone dough, the drizzle, or both. Just made these scones! I used brummel in brown instead of butter and sugar free maple syrup. They turned out a littlr more brownie like,but who doesn’t love brownies. They were less sweet than I expected, so next time I might add some splenda or more mapke syrup. Overall I was impressed by their googy chocolate flavor. I really appreciate your interest in my recipe Kimberly! Coconut flour will not work in this recipe. Almond flour may be substituted, but your scones will turn out denser. 🙂 I’d love to hear what you think if you try these! These came out a great consistency and pretty yummy but a little on the bitter cocoa side and not as sweet as I would like. How can i modify them to be sweeter? i used nestle toll house cocoa regular kind. These were very good! I appreciate this healthier version and my husband also liked them. I didn’t have Greek yogurt so used sour cream. Based on other comments, I added a tablespoon of maple syrup and decreased the milk by one tablespoon. I used Hersey’s Special Dark Cocoa and dark chocolate chips. I will make this again. Hi Amy! I would love to try these but when I saw the nutrition facts say that each scone has 8.6 grams of sugar, I’m not sure if that really good for my body or not…I’m trying to reduce my sugar intake and I like how many of your recipes use a minimal amount of maple syrup but I’m still worried after seeing the nutrition facts..what do you think? Even though there’s 9 grams of sugar, can it still be healthy? Thanks! I really appreciate your interest in my recipe Ashley! I personally think these scones are still healthy and small amounts of sugar eaten in moderation is totally fine, but I’m not a certified health professional. In my opinion, every body is different, and you know your body better than me! 😉 There’s a minimal amount of maple syrup, but if you have a preferred sugar-free sweetener, we can probably adapt this recipe to use that. Also, remember that the total grams of sugar also includes lactose from the Greek yogurt and milk! So it’s impossible to make these scones fully sugar-free when using those ingredients, but we can at least reduce the sugar further if you’d like. 🙂 I’d love to hear what you think if you try these scones! Made these scones this morning, they turned out ok. I have been experimenting with GF items, since I bake alot I feel pretty good substituting/adjusting items. I used 1/2 cup Oat Flour, 1/4 cup Tapioca Flour, 1/4 cup Brown Rice Flour & 1/2 cup Hershey Special Dark Cocoa Baking Powder. It turned out ok, I will agree with another comment that it seems like a brownie. Thank you for sharing this recipe, I would make it again & play with it a little more next time to try and get it a little lighter, with a little more rise in it. Thank you. I’m going to try these for my freezer cooking baked goods session! I’ll let you know how well they bake after freezing!